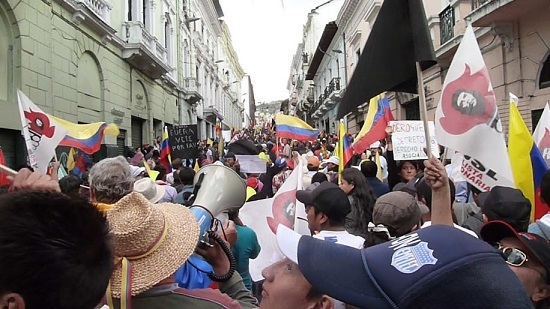 The largest protests – and by far the longest-lasting – against Rafael Correa’s government have been raging all over Ecuador since August 13th, when hundreds of thousands of people in a national strike called by the Indigenous People’s organizations and Labor Unions, took to the streets in Quito and other parts of the country. The goal was to vociferously show their discontent with a number of government policies and demand reforms. But it didn’t start on August 13th. Months before, on March and May of this year, there were major protest marches, plus several other important ones in Quito prior to these dates. The most visible gripes against the Correa regime are the regime’s intent on introducing 16 amendments to the Constitution, which would, among other things, remove term limits and allow indefinite elections of elected officials, including Correa. The problem is that the government would like to do it without carrying out a nation-wide referendum, as the Magna Carta calls for. The idea is to have the amendments be approved by a legislative branch totally controlled by the executive, which is highly questionable, since the amendments will introduce fundamental changes to a document approved by the Ecuadorian people. 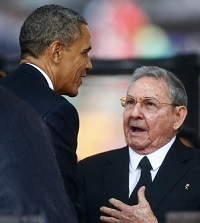 Correa’s arrogant and divisive governing style (which includes publicly and weekly insulting anyone who questions him or his policies) is another major issue bothering most protesters, as is the government’s slashing state support to retirees, labor laws deemed unjust, laws to limit rights of indigenous and communities to control water systems, the regime’s intent on silencing the critical press, and its attempt to silence unfriendly NGOs through presidential decree 016, just to mention some of the more visible ones. (Here is a complete list of CONAIE’s demands in English) . Human Rights abuses and police brutality used against protests starting on the 13th of August is only adding fuel to the protests, and certainly the illegal arrest and detention of Brazilian academic and journalist Manuela Picq, the partner of one of the indigenous leaders leading the protest, didn’t help the government. The expansion of mining and petroleum industries, though not as visible as the rest, are actually a major driving force behind the protests. 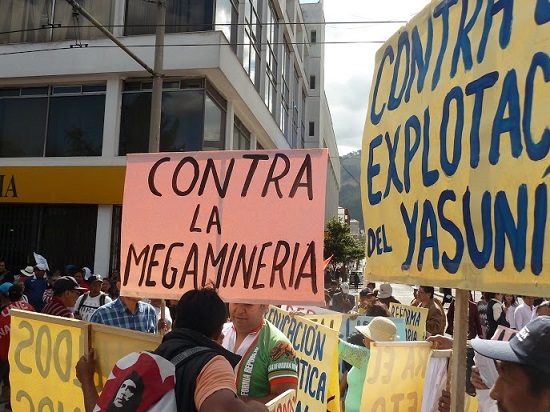 Not incidentally, the protests started on the 2nd of August in the mining areas in the south of the country, where there is fierce opposition by the Shuar and Achuar indigenous peoples and campesino communities to large mining projects. In fact, the two indigenous leaders leading the protests come from provinces affected by large-scale mining: Zamora Chinchipe and Azuay. The main issue here is that Correa’s government keeps doling out mining and petroleum concessions without genuinely consulting indigenous and campesinos who live in the areas affected by the unconstitutional concessions. The concessions are unconstitutional because the constitution calls for consultation before the government or private industries undertake any activity that may harm the cultural or environment of said communities. It is, in fact, this arrogance and attitude of imposition of the government’s policies at all costs that also brings a lot of the people out on the streets. Seeing Correa’s reaction to the protest, which ridiculed and minimized it (saying things like, that there were only 5,000 protesters in Quito on the 13th instead of the nearly 100,000), one can only conclude that there is a very real chance the protests will become more radical. Already there are dozens of protesters in jail, and dozens of police and protesters in hospitals. Perhaps even more worrying is the recent increase use of the military to quell the protests, especially as it is being used against more and more against indigenous peoples. The upheaval could be blamed on the falling price of petroleum, a major source of budget financing. But the problem is also seen as a consequence of misgoverning, according to some critics, who blame the government for not diversifying its extractive economy, or putting funds away during the recent petroleum boom. The government’s answer to less petrodollars is to intensify extractivism by opening up pristine forests in the Amazon populated by indigenous peoples to petroleum and pristine cloud forests and paramos to large-scale mining. Thus, it is no wonder why the plans are meeting fierce opposition. And what do the marchers want? Well, besides venting their anger at what they see is bad governance, unlike the government propaganda that claims the protests and strikes are a right-wing plot meant to destabilize his government, the protesters want the government to stop acting like it is the only legitimate political actor in town and the master of the truth, and to reform its policies and attitude. Given that the protests are spreading, and that the military and police are stepping up arrests, it is likely to be a long period of protest. Carlos Zorilla has been a full time resident of Intag, Ecuador since 1978. Founder of several organizations, including DECOIN, a grass-roots organization working in Intag area against large-scale mining since 1995. 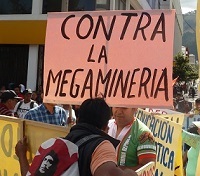 His activism has made him a target of both transnactional mining interestes and the Correa government. He has has been singled out by Correa publicly on three different occasions and falsely accused of writing a community manual to destabilized his government (See this article for more). For more contextual information on the recent protests, see this recent article by Marc Becker.